My foot is currently lying to you. I mean, I didn't get this tattoo because I thought it would be a particularly good idea. I got it because laughing at my own dumb whims is a big part of my life. 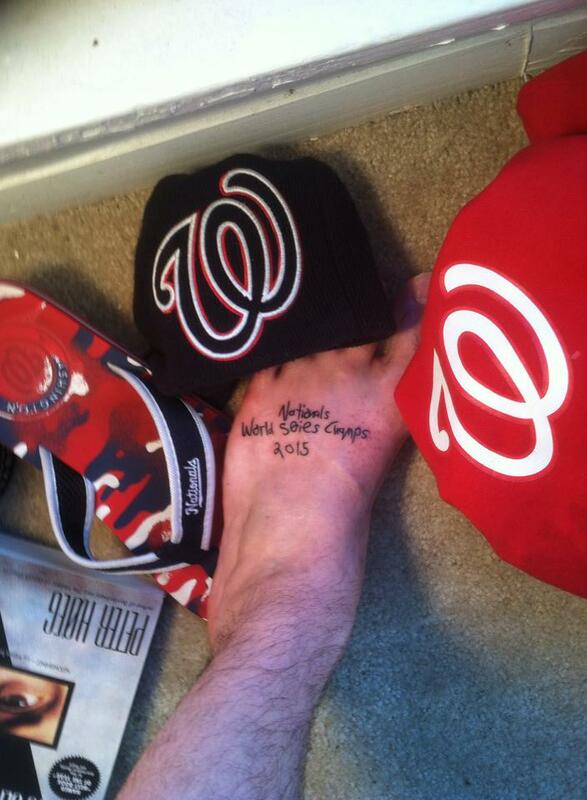 I'm not going to cut my foot off because the Nats are now officially ineligible to win the 2015 World Series. I'm going to keep my foot the way it is (although maybe I'll finally get that bunion checked out), because the tattoo still makes me smile. It is also a handy reminder that caring too much about things like sporting events or how people will judge you for doing things that make you happy is dumb. I really wanted to get a tattoo of my childhood dog's face after he died when I was 16. R.I.P. Sarge, I hope you're farting loud enough to wake up Mom who then wakes up Dad because she thinks it was him snoring in heaven. I didn't because I wasn't 18 yet and wasn't into the idea enough to go get a fake ID or whatever. Since then I've thought about getting several tattoos, but could never really decide on one I thought I would like forever. Turns out you don't have to know you'll love it forever, you just have to enjoy the experience. Up next I'm thinking about getting a tattoo about the time my three-year-old niece, who calls me Uncle Bubby, was heard talking in her sleep saying "Pass the marshmallows, Bubby." This is the best thing that has ever happened and I for sure would love that tattoo forever.